Make the rails sing around the Bay Area. A trip around San Francisco Bay sounds like a plan. Simple economy starting with mail from villages. Twelve industries available to cities. Seventeen products to move between cities. There are several starting villages and several other villages all with one industry each. No custom content. Original Map designed by Calm Dragon using USGS DEM data. 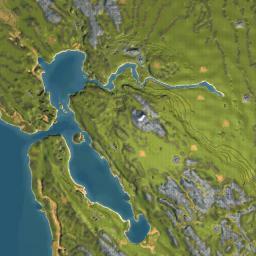 This map is for intermediate players. There are challenging goals that you may work toward. Have Fun and Happy Railroading! Fancy late game bridges may crash the game back to your desktop, though I have worked very hard not to allow that to happen. I DL’d this map, but whenever it loads, it crashes the game. I have updated the game to be compatible with Windows 7 and I have other usermaps that do not crash. I think it may have something to do with the SMR file. Where does that go? I just took a try and it worked for me. Are you sure that you have removed all files related to other maps? Have to cleared out the custom assets folder? Some installers add files there. I DL’d the SMR map shifter and the map works great. Thanks a much. I live in the Bay Area and would love to play this game. It crashes when it loads. I have a similiar problem with India, Longbeach and some others. There are some maps that work great like Iceland and Ukraine. Both are awesome. I am up to date with the patch, the 3genabler. I have loaded this game from steam so all the files are located under the steam folder. I would love to play more of these maps so please help. Although the first rail track in California didn’t happen until 1869 and it didn’t have the anvergure of what we’re building here, it doesn’t matter. Great map. This is truly a great map! Thank u very much for making this one!! When I try the map it crashes the game. I tried with the Map shifter and it still crashed it. I downloaded and checked the file, no problems. The map uses only standard map components. I then ran the scenario successfully to the very end, not a single crash.